President Yoweri Museveni (centre) with Moses Balyeku (left) and Igeme Nabeta. PPU photo. The long time political stand off between Jinja youthful legislators Igeme Nabeta (Jinja East) and Moses Balyeku (Jinja West) yesterday (Thursday) evening came to an end during the National Resistance Movement (NRM) leaders’ meeting presided over by President Yoweri Museveni at the Civil Service College in Jinja Municipality. President Museveni was in Jinja to meet members of Jinja East Constituency ahead of the by-election slated for March 15. The meeting was attended by over 1,500 delegates drawn from different administrative units. 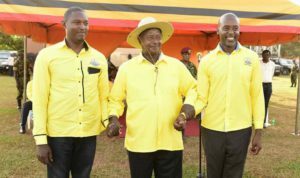 Prior to his speech, members hinted on the existing conflict between the two leaders provoking President Museveni to interject and task Balyeku to explain his position against Nabeta, the NRM candidate in the hotly contested by-election. “From now Your Excellency, I pledge my commitment to Hon Nabeta and the people of Jinja East and I shall stand by my word”, an apologetic Balyeku stated. “Being in Parliament with Hon Nabeta is more profitable to the people of Jinja than having Paul Mwiru…. Hon Igeme, we are now brothers in both action and words. We shall score in the same goal and from now, judge me by results,” Balyeku added. He was also quick to call upon his followers to join him in the campaigns to return Nabeta to Parliament. 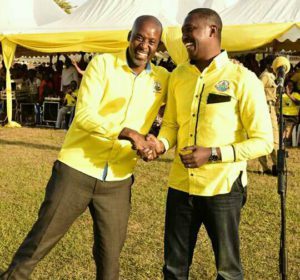 ” I also take this opportunity to apologise to the people of Jinja East Constituency….. Forgive me for all the wrong I have committed against you,” Balyeku said. The two later posed for a group photo with the National Chairman who congratulated the duo for burying their differences and accepting to work together. He said the two were still loyal party members and both voted for the amendment! of Article 102(b). The two politicians, Igeme Nabeta (left) and Balyeku, embrace soon after the reconciliation. Photo by Joseph Lyagoba. He further warned party members against escalating conflicts amongst themselves but instead work for unity. Earlier on, the soft spoken Nabeta hailed the party leadership for the overwhelming support so far showed to him. He also apologised to whoever he had ever annoyed and promised better working relationship. The meeting was also attended and addressed by several political leaders including the NRM Secretary General Hon Justine Kasule Lumumba and the regional Chairperson Hon Mike Mukula, among others. The Jinja Municipality East seat fell vacant after both the the High Court and Court of Appeal nullified the election of Nabeta, citing electoral malpractice. Nabeta will once again tussle it out with FDC’s Paul Mwiru who challenged his victory in the 2016 general elections.